ANDRÉ JOLIVET (1905-1974): 3 poèmes for Ondes Martenot and Piano (rec. 1972), ERIK BERGMAN (1911-2006): Omaggio a Cristoforo Colombo, Op. 119 (rec. 1992), Andante orgoglioso, ma con grazia from Danza senza nomine, Op. 13 (rec. 1998), USKO MERILAINEN (1930-2004): Piano Sonata No. 2 (rec. 1987), ERKKI SALMENHAARA (1941-2002): Kocab (rec. 1976), AARRE MERIKANTO (1893-1958): 6 Pieces, Op. 20 (rec. 2004), JEAN SIBELIUS (1965-1957): 6 Finnish Folk Song Arrangements (rec. 1979), Nocturne from Belshazzar's Feast, Op. 51 (rec. 1975), Romance in D Flat & Barcarola, Op. 24, Nos. 9 & 10 (rec. 1980), and works by Stravinsky, Debussy, Schumann, Chopin, Prokofiev, Haydn, Ligeti, Arensky, Rimsky-Korsakov, Rubinstein and Messiaen (The Reed Warbler from Catalogue d'oiseaux). Description: This tribute to a Finnish pianist and teacher contains 64 minutes of repertoire available nowhere else on disc with Jolivet's eerie and moody triptych, which dates from 1935 - only seven years after the creation of the Ondes Martenot, leading the way. Bergman's two works, from 1944 and 1991, show his stylistic progression from tonality to the avant-garde and Merilainen's (1966) shows his own personal modernist idiom. 3 CDs. 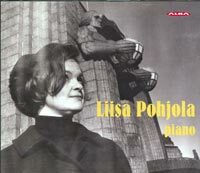 Liisa Pohjola (piano).